I was recently asked by an early career colleague for some advice on presenting their first conference paper. Instead of just an informal chat over tea/coffee, which is what I’d usually do, I felt a sudden urge to take some time to reflect upon, and record in writing, my own experience and practice of delivering (and listening to) conference papers over many years. Now, granted, the fact that I was in the middle of a pretty tough chapter of my monograph and just couldn’t face looking at it again that day may have had something to do with that sudden urge! Nevertheless, I ended up composing what became a long(ish) email with “my way” of doing conference papers which my colleague found useful and I’ve since forwarded to students who have asked for advice. I was actually just contemplating sending that same email to three of my postgraduate students, who are about to give their first academic conference papers soon, when I realised I should probably share this in my blog so that it can remain there as a point of reference for current and future students, as well as anyone else who may be looking for practical advice on the web. So here you go: the pointers and tips below outline “my way” of dealing with conference papers, especially those with very tight slots (20 minutes is pretty standard in large conferences). I am not claiming it is *the* way to do a paper, but it is my way, developed over many years, and it works for me! If it can be of help to others, that would be an added bonus! I start with looking at my notes, deciding what my main points are going to be, and narrowing down the scope by picking only a few strategic examples per main point. Usually research papers come out of a much larger research idea, but a paper is an opportunity to share some initial thoughts at the beginning of a research project, or share the most salient findings at the end of one, or report on such a project somewhere in the middle. So picking up 2-3 main ideas to develop in a paper, with a few well-chosen examples, is key. You can indicate that you have more to say on some things but had to set limits, as this will drive people to ask you to expand on a few ideas in the question session that follows. Then I write down the paper. I don’t do bullet points or notes because it’s so easy to misjudge timings and end up covering only half of what you wanted to say in the 20-minute slot. I write it down in complete sentences, but with a focus on oral delivery (so using the active voice much more than the passive, keeping sentences short and punchy, allowing some wit/humour where appropriate, and generally “writing as if I am speaking”). 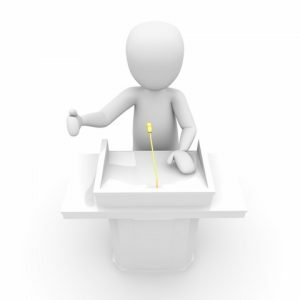 My personal limit for 20 minutes is about 3,500 words – but I am a fast speaker! The main thing is to rehearse the paper (in front of the mirror, in front of your partner, in front of friends, record yourself and listen back, whatever works to give you a sense of real delivery) and make sure you hit the 20 minutes comfortably. Conference chairs/moderators have the capacity (I would say the duty!) to be ruthless and can – and often WILL – stop you mid-sentence once you hit the 20 minutes! One last bit of practical advice on length: when you rehearse the paper at home, I can guarantee you it will be a tad slower than when you deliver it. When you are – as it were – “on stage” adrenaline kicks in and you will automatically go just a little faster, so bear that in mind too. I once heard a paper that was finished at 12 minutes. You don’t want that either. So if at rehearsal you’re (say) at 16-17 minutes, you probably need *just* a little more. AFTER I write the paper, I then construct the PowerPoint or handout. I usually include quotations, especially longer ones, as it is then clear what in the paper is yours and what comes from primary and secondary sources. Also, in terms of my area of expertise, there are often difficult names in Tolkien’s languages to pronounce, or bits and pieces in Welsh/Irish/etc., so it’s easier on the audience to be able to see them – never assume prior knowledge! When I use a PowerPoint I may include a slide when it is not strictly needed (perhaps a relevant image) as it keeps the pace of the talk even (the audience sometimes need to focus their attention somewhere else than you). Then I print everything in large font (as I am practically blind!!!) and have two printed copies with me, one in my suitcase and one in my handbag. You never know! Oh, and one copy e-mailed to me and one on a memory stick. The same goes with the PowerPoint. You can never have too many backups! If you’ve followed so far and had a go at all the steps above, you should (hopefully) be in a good place to deliver your paper. Best of luck and well done on having your first paper accepted! This would’ve been helpful to me in 1983. But that was BPP (Befiore Power Point). You’re a veteran, Mike – you could have written this!